Originally hosted by Breaking the Spine, Waiting on Wednesday has now linked up with “Can’t Wait Wednesday” at Wishful Endings and it’s exactly as it sounds: we post about books that haven’t been published yet, but we’re salivating by the time the publication date hits. Into Kisia’s conquered north, a Levanti empire is born. Loyal to the new emperor, Dishiva e’Jaroven must tread the line between building a new life and clinging to the old. 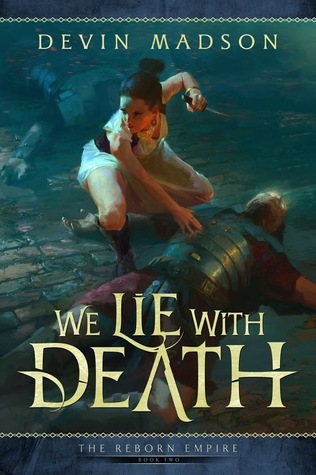 Only Gideon can lead them, but when he allies himself with a man returned from the dead it will challenge all she thinks she knows and everything she wants to believe. Now empress of nothing, Miko is more determined than ever to fight for her people, yet with her hunt for allies increasingly desperate, she may learn too late that power lies not in names but in people. Rah refused to bow to the Levanti emperor, but now abandoned by the Second Swords he must choose whether to fight for his people, or his soul. Will honour be his salvation, or lead to his destruction? Sold to the Witchdoctor, Cassandra’s only chance of freedom is in his hands, but when her fate becomes inextricably linked to Empress Hana, her true nature could condemn them both. There is no calm after the storm. I am so grateful for the SPFBO contest for not only getting quality self-published authors on my radar, but also forcing me to finally read some of authors I’ve always been meaning to read, but we all know how that goes. I seriously enjoyed the first book I ever read of Madson, We Ride the Storm, so I’m pretty dang stoked to see what happens next in the sequel (especially as we get Dishiva leveling up to a POV character, which I am SO HERE FOR). I need to preorder this one TONIGHT! Can’t wait! Ooh, you are in for a treat! So much… stuff! Eeeee, that makes me even more excited! I know, I am so excited to be branching more into the self-pubbed realm!